I loved this knit – such a wonderful project, and amazing results. The yarn is a little bit on the thin side for the project, and so the mittens aren’t large enough for me to line, but I’m very happy with them nonetheless. 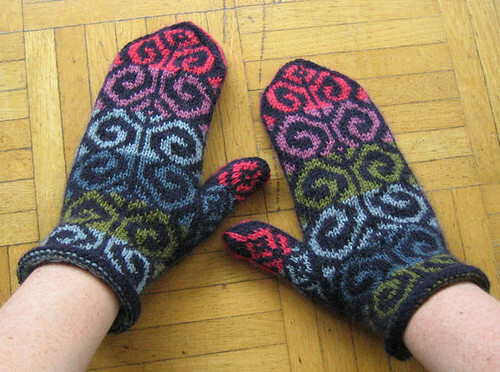 I realized pretty early that I’d need to add an extra repeat of the pattern in order to make the mittens long enough. 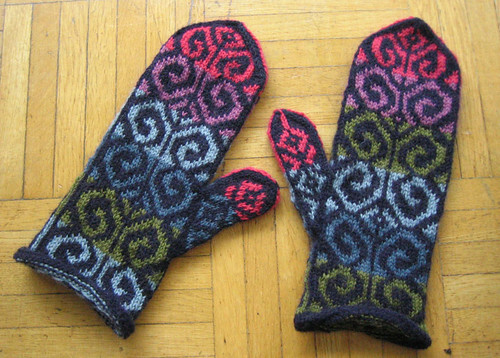 On the first mitten, on the left, I made an error, and the extra fiddlehead pattern wasn’t in the right direction. I also flipped over the chart for the pointy end of the mitten, so it would curl inward. 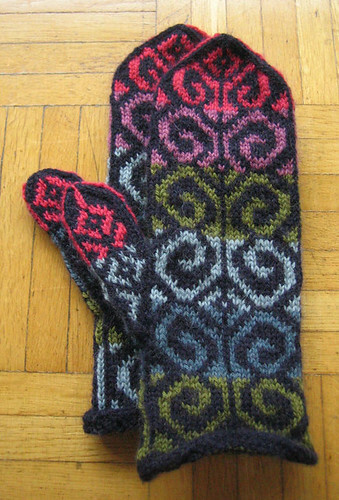 Also, on the second mitten I swapped out the colour order, which made it more fun to knit.